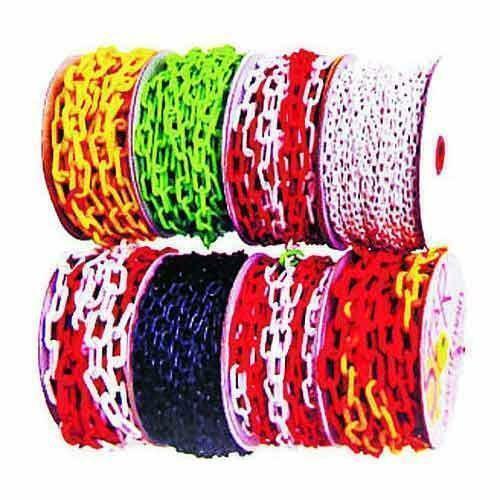 We have been successfully created a distinguished name in this domain and providing a comprehensive variety of Round Plastic Chain to our privileged customers. These products are exceptionally suitable for customers. Offered products are extensively reachable in various sizes as per the various requirements of clients. Our prominent clientele can purchase these products at reasonable prices. Founded in 1995, Dhanwati Enterprises is a fast growing firm and engrossed in manufacturing, supplying and service providing of wide range of Plastic Products. We are providing a finest array of Scarf Hangers, Bag Handles, Bedsheet Hangers, Belt Hangers, Bottom Hangers, Coat Hangers, Frock Hangers, Ladies Suit Hangers, Plastic Rings, Board Games, Corrugated Box Handles, Games Coins Dice Pieces etc. These products are developed in agreement with international quality norms engaging best quality material. This material is gained from most reliable vendor reachable in the market. Presented products are highly cherished in national market for their appealing design, fine finishing and robustness. Apart from this, our quality inspectors test the quality of these presented products on numerous factors to insure the excellence and quality.